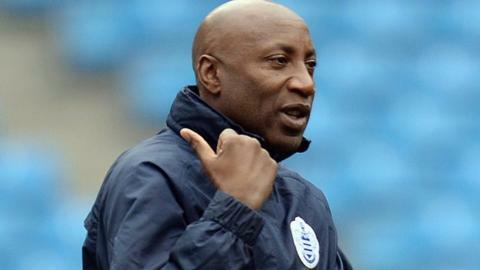 Chris Ramsey says he will discover "within a week" whether he will continue as manager of relegated QPR. The 53-year-old was placed in charge until the end of the season after Harry Redknapp quit in February, but could not prevent the club returning to the Championship after only one season. QPR have won two of Ramsey's 13 games. "I hope it will be me," he said. "As far as I know there hasn't been an interview process. But managers pop up even when there isn't one." The Hoops host Newcastle in their final home game of the season on Saturday. Redknapp has backed former Tottenham coach Ramsey to lead the club back to the Premier League. "I hope he stays," he told BBC Sport on Thursday. "I think he should be given the chance to bring the club back up from the Championship. But it's a difficult one now, and up to the board. "I spoke to club owner Tony Fernandes recently so I can't really say much more about the current situation." Ramsey, meanwhile, suggested there had been issues with some of the club's players. Midfielder Joey Barton stated some players in the dressing room, whom he labelled "bad eggs", had contributed to the club's relegation. "There have been some issues, but we dealt with them at the time," said Ramsey. "Unfortunately these things happen in football and our dirty laundry has come out. We have dealt with the situation and will draw a line underneath it and move on." Ramsey did not reveal the identity of the players, but various media outlets have named who they believe Barton was referring to.